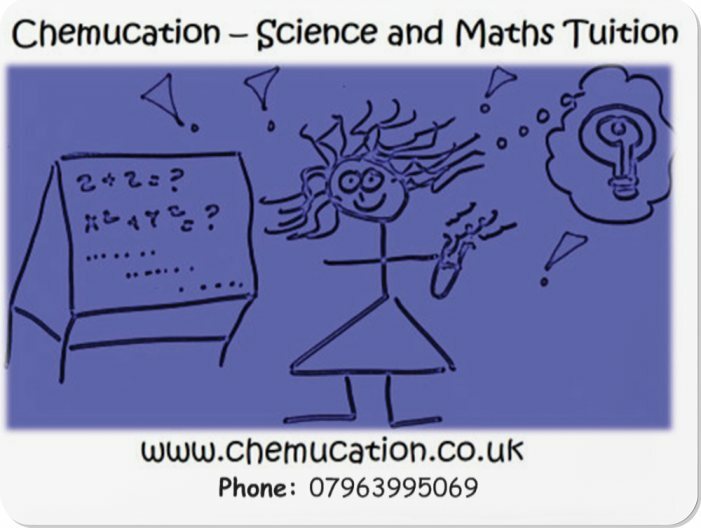 Chemucation was set up by Dr. Clare Daykin and is based in the heart of the East Midlands, UK. In addition to almost a decade of tertiary level teaching experience as a University Lecturer at the University of Nottingham, I can offer recent school-based teaching experience and three years personal tuition experience. I am familiar with all the major examination boards and sat on a University examination board for the award of undergraduate and postgraduate degrees for eight years. I have worked with students across the ability range, including the most able PhD students and children with special educational needs such as Asperger Syndrome, autism, ADHD, partial hearing and dyslexia. Having lived and worked abroad for a number of years, I also have experience of working with students for whom English is an additional language. I believe that everyone, regardless of age, background or ability can benefit from one-to-one tuition.I take a very individual approach to tutoring, adapting approaches and resources to fit the needs of the individual. Prior to commencing tuition we will agree tuition goals and I will work with these to develop a personalized scheme of learning. During tuition I will monitor student progress and keep records of this so that learning and attainment can be tracked and approaches can be continually adapted to meet the developing needs of the learner. However, most importantly of all, I believe learning should be fun. I am friendly and approachable and I work hard to ensure students enjoy having tuition, which ultimately will maximize the progress they make.